Some of the nation's starkest inequalities lie among the rich fields of California's Central Valley. Nowhere is California's inequality more clear than in Fresno, where the neighborhood a child is born determines not only how they will live, but even when they will die. In a southwest ZIP code of Fresno, life expectancy is 69 years. Six miles away, in a northern ZIP code of Fresno, life expectancy is 90 years. The Central Valley is the lifeblood of California. Its fertile fields feed the country. Yet in the region’s largest city, poverty reaches levels higher than nearly anywhere else in America. In Fresno, the nation’s deep-rooted inequality is laid bare. Where you’re born determines how you will live and when you will die. This project explores that disparity — between rich and poor, immigrant and citizen, white and black and brown. The stories are based on hundreds of interviews, dozens of public records requests and reams of court records and historical documents. Taken together, they reveal the consequences of growing inequality in the country’s richest state. When Maci was born to a mother addicted to heroin and meth, drugs coursed through her veins, too. Four days later, her foster parents had to learn how to give her methadone to ease her withdrawal. At 17, Zoe fled gang violence in Guatemala, traveling alone through Mexico to the Central Valley. But the most difficult part of her journey still lay ahead: finding a lawyer to stand by her side in immigration court and help her avoid deportation. On the first day of school, a white officer stopped Keyshawn, a black student, for jaywalking. Minutes later, the officer put Keyshawn in a headlock and slammed him to the pavement. One thread binds these stories together: the streets of a city that is deeply unequal, where the gulf is embedded in the city’s geography. 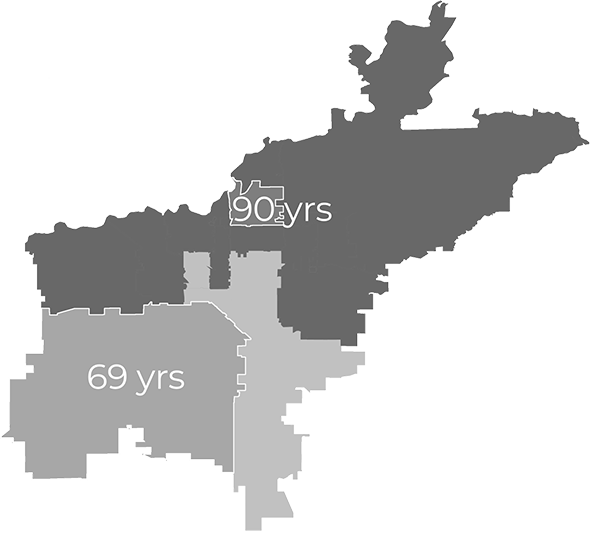 In the exclusive enclaves of north Fresno, life expectancy is 90 years. The neighborhoods are some of California’s richest, on par with parts of Silicon Valley and Beverly Hills. In the city’s south and southwest, Fresnans live, on average, 20 years less. There is more concentrated poverty there than nearly anywhere else in America. Segregation here is older than the city itself. It began with the tracks. In the 1870s, Fresno was just a stop on the Southern Pacific Railroad. White homesteaders and speculators built their homes east of the tracks and confined a growing Chinese population — who built the railroad — on the other side of the tracks, the west side. In the decades that followed, national, state and local policies repeated and reinforced the segregation. Fresno’s earliest city plans wrote separation into law. Southern neighborhoods were zoned for heavy industry and affordable housing, and white affluent residents moved north. Then a federal government practice known as redlining solidified this pattern. Later, the construction of a state highway razed blocks of existing housing. Today, Highway 99 — “Fresno’s Berlin Wall” — is yet another barrier between the southwest and the rest of the city. After World War II, as Fresno’s black population grew, the newcomers had few options but to move into those neighborhoods. By the 1950s, nearly 100 percent of black Fresnans lived on the west side. That’s also when the county granted Sierra Meat Company a special exception to its zoning rules, allowing the company to open a slaughterhouse and meat packing plant on the city’s southwest side. In 2016, the California Environmental Protection Agency found that west Fresno was among the worst polluted neighborhoods in the state with high rates of asthma, low birth weight and cardiovascular disease. Last year, the city council made a deal to move the meat processing plant, now owned by Darling Ingredients, out of the southwest. City officials have also committed to investing in downtown and in long-neglected southern neighborhoods. They’ve promised more parks, better transportation, equal opportunity. Here we examine the state of a city that was unequal from its birth. That history is embedded in each of the stories that follow. Opening text by Reis Thebault and Margaret Katcher. On its streets — in traffic stops, searches and arrests. In its schools — in suspensions and expulsions. And in its jail — in who’s locked up and for how long. Unequal treatment is the norm in Fresno. Unaccompanied migrant children in the heart of the Central Valley face more challenges than their coastal counterparts as they fight to remain in the country. A pregnant woman is torn between drugs and the baby growing inside her. A victory was declared when a new pesticide regulation banned chemical use around schools. But what happens when the children go home? When one sibling grows up undocumented and the others as American citizens. Soaring methamphetamine addiction in Fresno County is driving an increase in child abuse and neglect, creating conditions one veteran child abuse specialist says are the worst he's ever seen. Three women recount the devastating impact meth addiction has had on their families, their children, and their community. Fresno’s mothers of color are suffering, and the city wants to help. Why is that so hard?